Why spell out Miscellaneous? Why spell out television? The answer to both? Symetry. How many words have I mispelled so far? Anyway, I think the American version of The Office has fully diverged from the UK original. It’s about time. I do enjoy the UK version, but only 14 episodes were made, so it’s not like anyone is butchering Monty Python or Fawlty Towers, though a Doctor Who series could be intriguing. I find it hard to stomach people’s opinion that the show is bad because it’s a rip off. Ricky Gervais (David Brent and UK creator) and Stephen Merchant (co-creator) are involved with the American Office. Steve Carell is unquestionably one of the biggest draws of the show, and Rainn Wilson is unquestionably the comic quirkiness of the show, but I think the amazing work that John Krasinski (Jim), Jenna Fischer (Pam), B.J. Novak (Ryan), Angela Kinsey (Angela), and Brian Baumgartner (Kevin) do is often overlooked. If you can watch any episode and not think that John Krasinski is the secret star of the show, watch it again. If you did happen to miss the Season Finale “Casino Night” you can purchase it on iTunes for less than a cup of coffee. I’m pretty disappointed in the ending of Survivor. As I mentioned in a previous post, I haven’t watch the show since the third “season” but somehow got hooked on this year. I was rooting for Terry to pull it out, because he was definately the best competitor and strategist for the hand he was dealt. I’m only satisfied with the outcome because I’m glad Danielle, who never really played the game, didn’t win. I thought she had a great opportunity when Austin and Terry invited her into their plan, but she gave it up. Also, as I’ve mentioned before, I’ve never watched Amazing Race before, but this season dragged me in at the second episode and I’ve been watching ever since. I think it’s pretty fascinating and I’m happy to see these final 3 teams compete for the finale. “The Hippies” in the show have an inspiring outlook on life and the game despite the way they’ve been treated by the others. Oh my. I will spare you any theories on the show, because I know there are people who haven’t caught up to the latest episode yet. This show continues to blow my mind. It’s perhaps the best action/drama/adventure/mystery series ever on television…there I go spelling it out again, but admit it; it sounds better than TV. 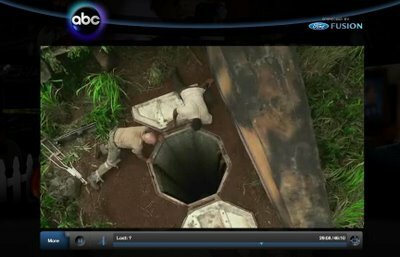 If you don’t know already, you can watch the latest episode on ABC.com for free. Just click launch and chose Lost. You’re also able to watch other ABC shows, too. It’s a pretty slick in browser player with an incredibly well done compression and there is no lag or buffering hangups. You have to endure a couple of commercials, but all in all, it’s pretty sweet. I just rewatched “?” because I had a few questions floating in my head. Questions answered; I continue with my theories…but with even more ?’s than before. Lost is also available on iTunes, where you can download every episode to catch up with this phenomenon.